Here is a great example of a company maximizing the use of micro blogging. 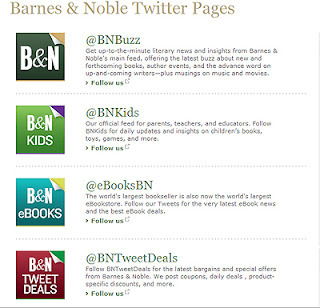 Barnes & Noble has seven twitter pages with their brand on them, ten altogether. Each of these pages covers a purpose. In addition to news, customer service and marketing, they cover education and entertainment as well. What separates these Twitter pages from a traditional Web site is how specific they can be; almost like mini-Web sites. There is a Twitter page for children, parents and teachers. There are 3 additional pages to assist kids with grammar, homework, and SAT preparation. The B&N buzz page offers information about new and upcoming books, author events, writers, etc. There is a great page called Studio where B&N lists their in-store events not just for authors/readings but for music performances also. What I liked most was “Did you miss this event? Click to watch it here.” There is a page where B&N will tweet you with deals and sales on merchandise. There is even a B&N book club page on Twitter where followers can discuss literature. B&N has a Twitter page just for e-books. B&N is David to Amazon’s Goliath; Best Buy will be selling both B&N’s Nook e-reader & Amazon’s Kindle by the end of the month. The e-book Twitter page is a low cost way to try and get ahead of Amazon. I believe that Barnes & Noble is using Twitter to the fullest. I haven’t seen anyone take advantage of it the way that they do. One final note: the same “How to use Twitter” instructional video we watched for this module is right on the main B&N Twitter page.